I speak now to all those who are of of a mind to fight until no foes remain standing, who enjoy a horn brimming with a tasty beverage, and are willing to join their extended family with voices lifted in song well into the night – Of course I speak to all those who’s heart calls out for them to join the Early Period side (occasionally known as the Great Heathen Army). Declare for us, as we show all that fancy fabrics and overly polished metals are no threat to those who possess a strong arm and a heart that beats in time with the war drums. Our Skalds will tell of our victory over the puffed up peacocks of the Late Period “Army”, long after our swords have grown dull. So join the time period that is obviously better prepared for victory, as we take the field in just over a months time! The Black Star Ad has been updated to include the Sable Shield Tournament and Elfsea’s Baronial Investiture! Please check out the new version Here! The heathens of old are crawling out of the woodwork and from under the rocks trying to assert that they are the best. The more sophisticated, intelligent, better armed, better trained, better dressed (and better looking) artisans, organizers, fighters, shooters, and everything you can possibly think of, people that are from an era of higher enlightenment will be there to put them back in their place! Join the forces of the later period so you too can taste the sweet nectar of victory! Do not let the old darkness creep in to your heart and soul and wind up face down in the dirt with the early period forces! To the victor go the Spoils of War! 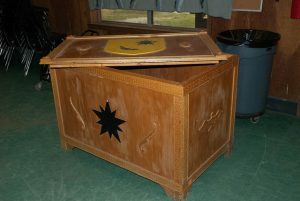 All participants in Marshallate Activities and A&S are encouraged to bring a donation to the War Chest. The War Chest will be distributed at Sunday evening court by the Warlord of the winning Period. 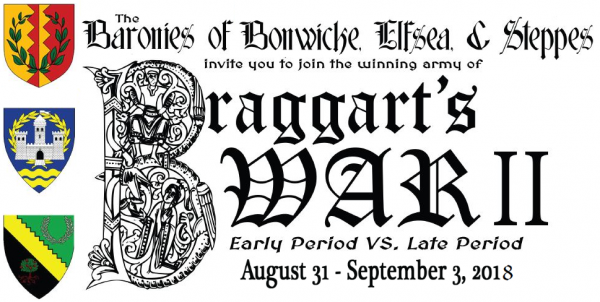 Braggart’s War II is coming August 31 – September 3, 2018.